mainly macro: The pre-recession UK debt fuelled boom that never was? The pre-recession UK debt fuelled boom that never was? You know, when we all went on a borrowing binge and there was a housing bubble and now we are all paying for this excess. I hear this often in comments, as well as the media. It is a story that seemed implausible at the time, but is it more plausible now? This post is about an alternative story that is in many ways rather more interesting. So we were saving less, which means we must have been borrowing more, and going into greater debt. The ratio of liabilities to personal income rose from 1.2 in 2001 to 1.8 in 2007. However that was nearly all mortgages. The ratio of non-mortgage debt to income did rise, but from 0.34 to 0.43. So far, it all seems to fit the story of a borrowing boom that ended in tears after 2007. But if that was the case, more borrowing would be accompanied by falling wealth. In fact, quite the reverse is true. 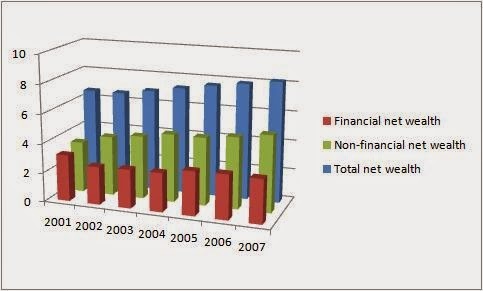 Financial net wealth as a proportion of income fell in 2002, but then gradually rose again. Non-financial net wealth relative to income steadily increased. So, over this period, the average UK consumer was getting significantly wealthier, despite borrowing more. The reason is straightforward - house prices were rising. I’ve set UK house prices against those in the US to make a crucial point. In the UK the ratio of house prices to income appears to be on a rising trend, whereas in the US they are not. In these two posts I speculate that the reason for this trend is a combination of falling long term real interest rates and lack of growth in supply. We have arrived at a critical point. Given the recent recovery in the UK housing market, what happened in the 2000s looks much less like a bubble, and more like a rising trend. It is a trend that makes perfect sense using standard theory. So it is worth exploring what might be the consequences of a trend rise in house prices for consumers. The most obvious point is that the ratio of mortgage debt to income is bound to rise. What will also rise is net wealth, because the mortgage is a proportion of an asset that is rising in value. That is exactly what we see in the data. What about the increase in non-mortgage debt, and the decline in the savings ratio? This is where it gets interesting. Two key motives for saving are for retirement, and as a precautionary buffer against adverse shocks. Rising house prices reduce the need for both. To a partial extent we can run down the value of our housing wealth to help fund retirement. Housing wealth can also substitute for precautionary saving, because we can use the asset as collateral to borrow following negative shocks. On both counts, there is less need to save. In the US there is a big debate over the extent to which the Great Recession was a consequence of the financial crisis, or a housing crisis. (See Mark Thoma here.) In the UK, it looks much more like a financial crisis. 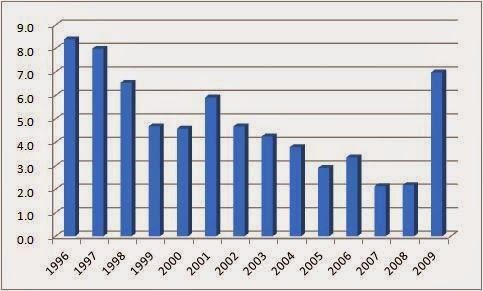 So was there a boom at all in 2007? The OBR measure, which is based on concurrent survey data, suggests a positive gap of around 1% from 2003/4 to 2006/7, rising to 2.2% in 2007/8. However, given that they had to recently modify this measure, we should put a large standard error band around these numbers. The numbers calculated by the OECD and IMF are much higher (OECD 4.9% 2007), but as I explained here, these estimates effectively backcast the apparent fall in supply seen since the recession. David Cobham sent me a nice chart which illustrates this. 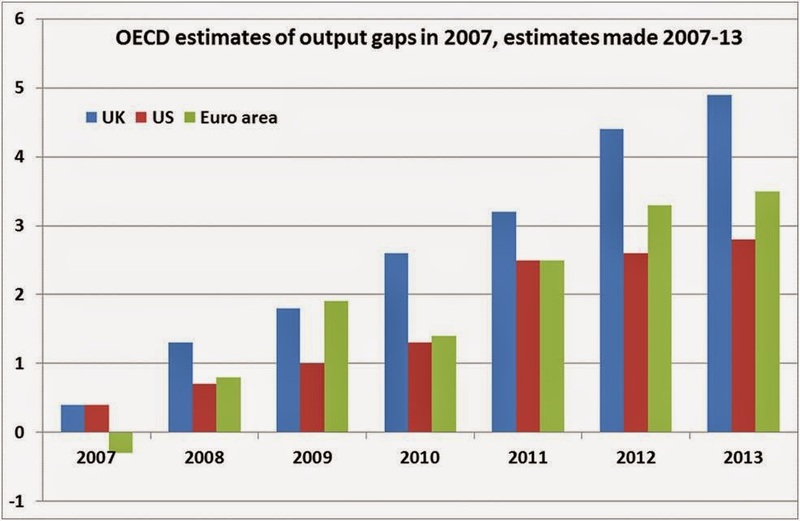 At the time, the OECD did not see any boom in 2007. Only in retrospect, particularly as the UK’s productivity puzzle emerged, did they conclude that there must have been a boom, because productivity normally changes slowly. But as we have no explanation for this productivity puzzle, this is really just guesswork. And it raises another puzzle of its own, which is why a boom of this magnitude had no impact on inflation. To conclude, the evidence that there was a significant UK boom before the Great Recession is pretty weak, as is the idea that it was due to profligate consumers or government. So why do many people say there was a borrowing led boom? Partly this may just reflect a tendency to assume what happened in other countries must have also happened in the UK. Partly it may reflect a sort of economic moralism: our problems today must reflect our personal sins of the past. But we should also note that this story about UK debt does distract from what was a clear cause of the UK recession: a financial crisis caused by unwise lending overseas by UK banks. How, if you were to be given a one-man puissance over the housing market, would you get more homes built in the UK while causing the minimum of discomfort to current home owners? Would you diminish or abolish the greenbelt? In the US you can walk away from your home (and mortgage). Maybe first start with defining what a housing boom actually is, as this post suggests this is not clear. A ponzi scheme is no problem, as long as it keeps running. Same for housing booms or debt fueled economies in general. What I would like to know from economists is when the boom turns bust. If economic models can't predict this, what's the point? Fixing Britain's problems will require solutions that involve looking outside the Neo-Classical synthesis model and really questioning the assumptions of this model which has dominated policy since the 1970s. The US experienced no general economic boom during the pre-recession years, but they clearly had an unsustainable buildup in house prices. In that sense, the lack of inflation and a large output gap in the UK does not tell us whether or not the UK had a housing bubble. The US most certainly had a bubble even though there was no spike in inflation or in the output gap there. As anonymous points out above, American mortgages are nonrecourse while British are recourse. Therefore, even if the two countries had suffered identically large housing busts, defaults still would've been far more common in the US. Defaults also have an effect on house prices so at least some of the difference in how prices developed can be explained by this. The crucial question is of course whether the trend of rising house prices is sustainable. If it's caused mainly by the decline in government-paid housing counstruction, it's going to look like a bubble, for example. I personally don't find the "house prices must rise because britain is a small country with a big population" argument convincing since I remember how it was also used to justify Japanese house prices in the late 80's (Japan being a far more densely populated country than Britain). I agree its the crucial question. If you accept that real interest are likely to stay lower than they were in the 1980s/90s, then it seems to me that the logic that house prices must rise if supply is static is fairly watertight. What you can also say is that if in 2014, house prices in 2005-7 do not look too high, then its hard to call 2005-7 a bubble. What you can also say is that if in 2014, house prices in 2005-7 do not look too high, then its hard to call 2005-7 a bubble. Depends where you live. If you live in the South East in a catchment area near a good school, the price never seems to be too high. Another fascinating read (as was Ben Broadbent's speech). Is there a reason that you referred to the financial crisis as "a" clear cause and not "the" clear cause at the end of your post? I'd be interested to know what the other contenders are if not domestic debt. FWIW I think that the evidence on the role of reckless overseas excursions is compelling - one need only recall RBS' acquisition of ABN Amro or HSBC's troubles in the US as vivid reminders. However, I do wonder if you dismiss the household domestic debt possibility too quickly? To go from end to start - Broadbent's argument appears to be that low write-offs in the wake of the crisis are not commensurate with some sort of housing boom and over borrowing by households - but this one piece of evidence could be challenged by a couple of other things that have emerged post crisis: 1) some not insignificant forbearance by banks (something the BoE was worried about 2-3 years ago) 2) the apparent sensitivity of households now to even modest increases in base rate (as pointed out by e.g. the BoE, the Resolution Foundation and the FCA). It is not clear to me that a household sector that had no debt overhang would a) need forbearance b) be so sensitive to such modest rate increases. There's also the question of distribution - from the wealth and assets survey and other sources, it appears that financial wealth in particular is mega concentrated in the top couple of deciles. 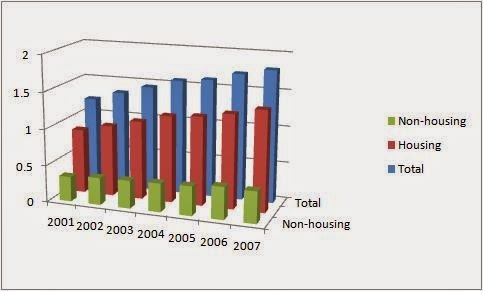 Housing wealth is less so, but there is evidence from WAS and NMG to suggest that not all netting of debt is the same. The poorer households tend to have much more debt relative to assets (and income) than the middle and the middle more so than the top. So it is quite possible that the lion's share of the net wealth gains accrued to a subset of the population - and possibly quite a small one - while the debts were more concentrated in the middle and at the bottom of the distribution. So large scale over-borrowing would still be possible even if aggregate or average net worth is rising. One thought on your argument that: "if that was the case, more borrowing would be accompanied by falling wealth". Does this not ignore the stability of asset values? Over-borrowing relative to assets might not show up until after the fact, when assets are re-valued suddenly (e.g. 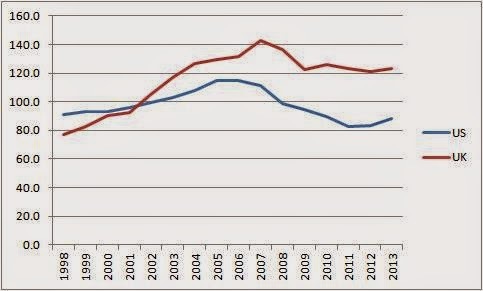 dotcom or the house price declines during 2007/08). Debt is not subject to the same revaluations unless one defaults. This might be where a measure such as debt to income might be more useful as a measure of sustainability/over-borrowing. On the real economy side - one thing that strikes me is that both the overseas and domestic household lending stories are consistent with an output gap that is not overly positive - mortgage borrowing goes into a non-productive asset and credit flowing abroad would surely help foreign economies to boom rather than our own. So absent a massive propensity to consume out of housing wealth, it might not be so surprising to see a not particularly extreme real economic impact. And this would be entirely consistent with both a "Broadbent" and "UK household debt" story at the same time. On the sustainability of house prices, I wonder of the point is less are they sustainable or fair valued when compare to fundamentals or are they fair valued in the minds of the people buying at a given point in time. Something along the lines of Soros' reflexivity? Anyway, a very interesting post and one that I read a number of times before submitting a comment. No significance in 'a' rather than 'the'. I think your point about distribution is a good one. A longstanding story about the US crash is that it is about growing inequality, with those at the bottom borrowing to keep up with the rest. I, like Paul Krugman, have my doubts about this story, but it would need some serious work getting behind the aggregate UK figures to investigate it further. Brilliant article. My only comment is that rising house prices, funded in the case of those with mortgages by willing savers, does not raise aggregate demand, does it? Reason is that the latter phenomenon does not cause additional goods and services to be produced. And that’s a point which perhaps supports Simon’s thesis. In contrast, a rise in debts which fund NEW HOUSE CONSTRUCTION or any other new real investment WILL boost AD. I may be missing several points but I'm not sure we need to find a boom. My understanding is that people were supplementing there income with debt backed by rising house prices. There has been little default on debt because people protect their homes first and make cuts elsewhere, hence the drop in consumer demand. If the cost of the debt rises we may yet see more defaulting. The 'economic moralism' is allowing house prices to rise faster than wages and letting them become investment vehicles instead of homes. Have just drafted comment but it seems to be lost. The best evidence for a boom in the UK in 2007 is the combination of appreciating currency, trade deficit and little evidence of productivity gain. There was no inflation because the currency was taking the strain. This was all clearly explained to us macroeconomics students at the time as part of our undergraduate course at UCL in London. No hindsight was required. I did not explain myself clearly enough. The decline in the savings ratio is real enough, which means consumption will run ahead of output, producing all the things you note. But my suggestion is that this was a natural consequence of rising house prices, which was not a 'bubble' but due, in part, to static supply. The key implication is that there was nothing that would generate a subsequent recession. How did credit supply and credit demand develop at the time of the financial crisis? I dare to bet that the credit losses outside the UK led to a credit crunch in the UK. Housing supply is largely fixed and prime locations are certainly fixed; new supply tends to be on marginal land. We saw house prices more than double in ~8 years. The population did not double, household creation did not double, earning did not double, the supply did not suddenly change compared to the previous 8 years. The rise in prices was clearly caused by an increase in credit availability, allowing purchasers to bid up the price on a good with fixed supply. Rising prices encourages more lending in a feed-forward mechanism. To counter this I would (have) advocate a shift in the tax base away from earnings and on to property, encouraging the efficient use of existing housing and encouraging "savings" into other areas that are more productive. Off topic of this particular posting I know, but in case you didn't realise, an evidently economically illiterate sophist on Conservative Home webpage has attempted to take you to task on your previous post regarding UK GDP figures and falling productivity. Stating that as one of those neo-Keynesian economists who have been now proved so wrong about macro policy, you are apparently desperately scrabbling around for some bad news to seize on from the deluge of good economic data, and there is no reason at all to be concerned about low productivity at all! I should have provided the weblink for you, so you may read, marvel and laugh at Peter Franklin of Conservative Home's economic insights! What Rupert said. Housing wealth is generally skewed towards the old and the better-off - the older you are, the more of your mortgage you have paid off, while richer people tend to have smaller mortgages anyway. So although the figures show that the debt increase is pretty much matched by assets, distributionally this is not the case: the older and richer have seen their wealth grow, the younger and poorer have equivalently seen their debt grow. Mark Carney observed that the British people will maintain their mortgage obligations at all cost. Therefore I would expect that rising house prices forcing younger people to take on more debt relative to income than their elders did would cause a falling savings ratio. I would also expect rising interest rates - as there were in 2004-7 - to cause deep cuts to discretionary spending by more indebted homeowners, without any offsetting increase in spending by less indebted homeowners, the majority of whom are middle-aged and elderly and therefore less likely (or indeed able) to borrow against rising prices to fund consumption. Both the falling savings ratio and a mild recession can be explained by this alone. The financial crisis in my view is ADDITIONAL - it made what would have been a mild recession triggered by rising interest rates much, much worse. I agree with you about the absence of a boom, though. The rising prices do indeed look supply-led to me. In the US, Ireland and Spain, prices continued to rise despite rapidly increasing supply - I would regard that as evidence of a bubble, personally. In the UK there was no construction boom, indeed supply remained tight throughout this period - but there was a rising population. I hate to say this, being a fan of migration, but rising prices are at least partly explained by the high immigration rates in the 2000s. But in my view the solution is to increase supply, not restrict immigration. housing ratio is better than non housing its really good . but some countries have this type of problems . we have great solution of your problems . . .